Chris Ronnau volunteered for the Army and was sent to Vietnam in January 1967, armed with an M-14 rifle and American Express traveler’s checks. 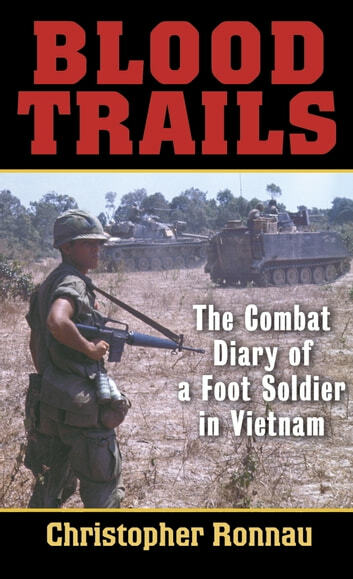 But the latter soon proved particularly pointless as the private first class found himself in the thick of two pivotal, fiercely fought Big Red One operations, going head-to-head against crack Viet cong and NVA troops in the notorious Iron Triangle and along the treacherous Cambodian border near Tay Ninh. Patrols, ambushes, plunging down VC tunnels, search and destroy missions–there were many ways to drive the enemy from his own backyard, as Ronnau quickly discovered. Based on the journal Ronnau kept in Vietnam, Blood Trails captures the hellish jungle war in all its stark life-and-death immediacy. This wrenching chronicle is also stirring testimony to the quiet courage of those unsung American heroes, many not yet twenty-one, who had a job to do and did it without complaint–fighting, sacrificing, and dying for their country. 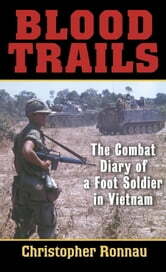 A daily journal of a PFC who did his job well. Wrtitten for himself and those who died. Some were heros some were fates of war some made stupid decisons. I was there the same time with the 1st engineer batt. The same operations and sights and sounds. A good description of what a lot of good men went throught. Thanks for the memories. ?